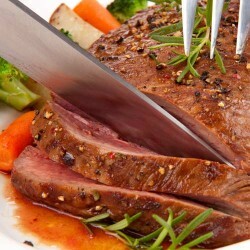 Whole Beef Fillet (Chain On)Pack Size1 x 4lb+ fillet vacuum packed .. Whole Beef Ribeye JointPack SizeApprox 2-3kg .. Whole Beef SilversidesPack SizeApprox 9-11kg .. Whole Beef TopsidePack SizeApprox 6-8kg ..
British Beef StriploinGreat for Roasting or Sirloin SteaksPack SizeBy weight - approx 5k.. Beef Bone MarrowPack Size500gCountry of OriginFrance ..
Ox CheekPack SizePer kg ..